Every year when my contacts run low, it's time to re-order more. Usually, I time it pretty well so that the old & new boxes overlap with one another. 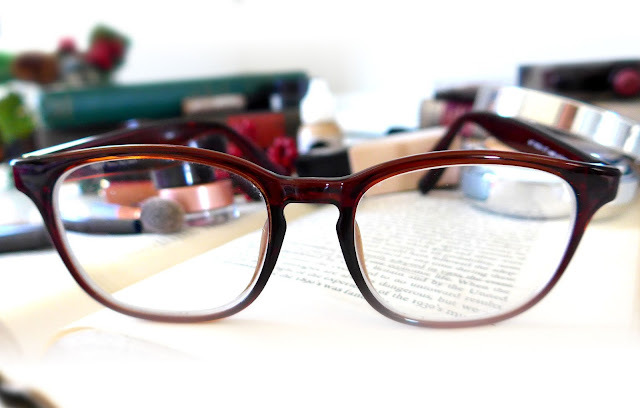 However, this time, life got ahead of me and I found myself sporting my frames for a week long. I can't go to Taiwan without stopping by the beauty counter! You can probably catch me at either SaSa, CosMed, Watsons, or simply wandering up and down the halls at the department stores about 40% of the time on my trip. Our skin is just that unique. Sometimes, for example, with American brands (ex. M.A.C) the foundations can come off too heavy or harsh for my skin tone. With Asian products, they're more tailored to Asian specifications. They have some brands that they simply don't sell here in the states! I love that a lot of these formulas tailor to my oily T-zoned combination skin. As an added bonus, it's just fun wandering around these rows -- they have such interesting items in the cutest packaging! Sorry, all. I have been slightly MIA these few weeks months. Now that March is almost over (Where did the time go! ), what better time than to start talking about.. February? Yeah, that's right. F E B R U A R Y. I finally got the chance to return to the motherland to see almost all my family. 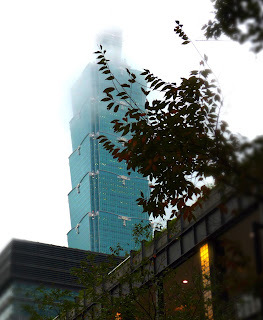 I remember talking to my dad about what Taiwan was like during Chinese New Year. He then asked if I wanted to go with him this year, and I of course hesitated worrying over taking days off of work (I'm a work dork). However, everything seemed to work out on that end, and I got to see myself on a nonstop flight to Taiwan! I was extremely excited to get to see all my new baby nieces and nephews. I'm an auntie! Took me awhile to get used to being called that, but you couldn't take that title away from me. Why did I get so attached, knowing that I'll just have to leave them in a few days? That's a loaded question, isn't it? CNY in Taiwan is kind of cray, especially the malls on New Years. It's all those people trying to spend those red envelopes! Anyone who frequents their social media feeds will probably recognize the brand Glossier, created by Into the Gloss. I've been dying to try it, and finally got my hands on a set over this winter season. Let me tell you, the hype definitely does not disappoint. First of all, let's talk about the packaging - including the box it was shipped in. When you open it up, it looks so.. insta-worthy! 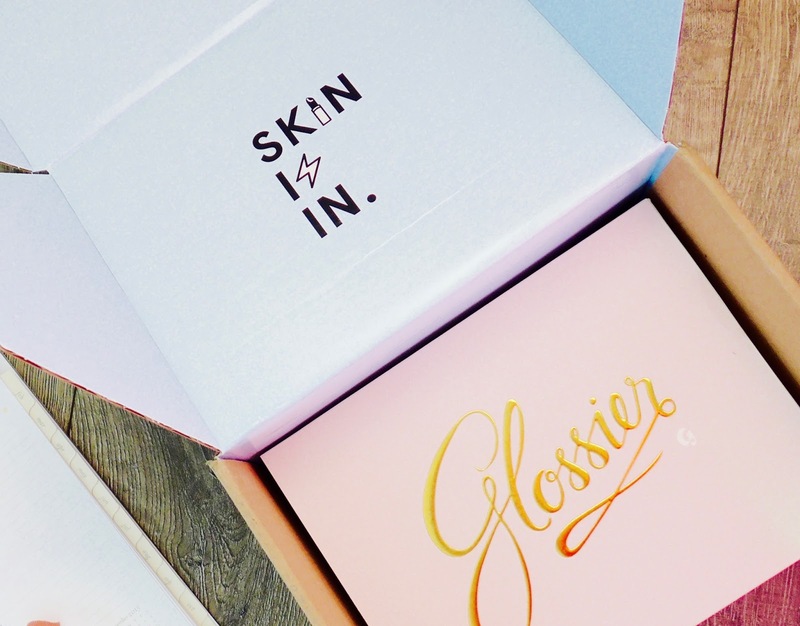 I have never once had the urge to want to keep the shipping box before, but glossier had me hesitating (I ended up not though..). The pink zippy packing bags are such a genius idea as well, it'll make such a cute traveling pack. The stickers that they include to decorate the products are so cute that I have an inward battle on whether to use or not. Shallowness aside, the products don't disappoint either. They claim to be hydrating (check! ), gentle (check! ), and refreshing (& check!). I found myself using the priming moisturizer and skin tint together almost every day, so much in fact that they found its way at the top of my vanity! Because it's an online company, selecting the right tint can be difficult. However, they do have a tool to help you choose your color based on your skin tone. Just a heads up though, their tints tend to stay on the lighter side. 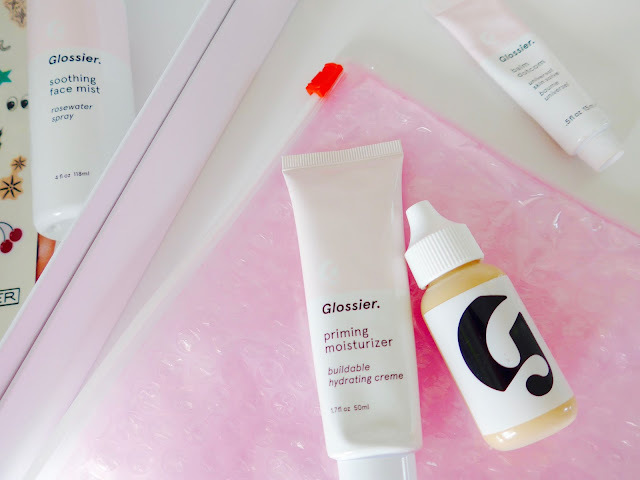 I usually use 'light' for my foundation tints, but for Glossier, I find myself going towards the dark side. The texture to both these items are so thin and moisturizing. It almost doesn't feel like you have any makeup on - almost like you have a photo filter on for the day! I liked it so much, I gifted one to my best friend for Christmas. Have y'all tried it? What do you think? Have you also tried their mask? Let me know down below! p.s. 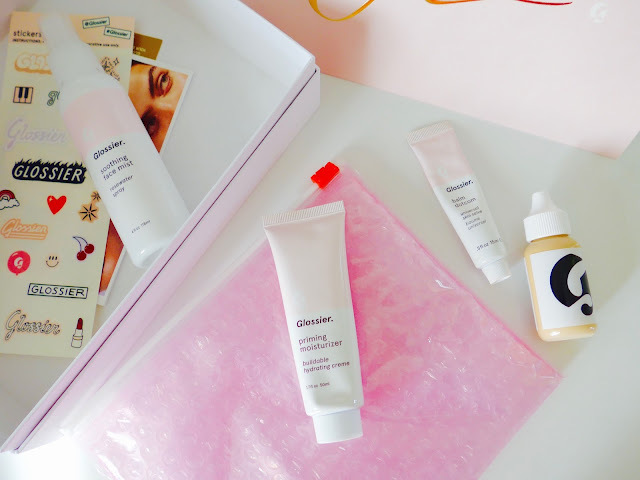 I am in no way sponsored by Glossier, but aw shucks if I was, that would be awesome! Collecting lip products has become an uncontrollable guilty pleasure of mine. I am always on the hunt for lip colors that I can wear every day for every occasion. Although, sometimes during the winter you've got to spice things up with some rosy hues to warm up the holiday season. My lips are generally more on the plum side, so darker hues have usually been working in my favor. I decided to pick up a few of these babies during the Sephora VIB rouge sale to test out the hype. These elegant Burberry Kisses have slowly earned a permanent rotation on my vanity, and I wanted to share it with all of you. It's not the outside that matters, but the inside. But seriously though, let's take a look at the gunmetal exterior. The cap so magnetic, that it effortlessly squares up to the label so it's always in perfect position. You have no idea how much this warms up my little OCD heart. This line of lipsticks is so hydrating and so buildable in color. The Rose Blush has earned a spot in my makeup bag in my purse, as it creates a MLBB look that is to die for. Have you tried any of the Burberry Kisses? Will you? Which is your fave? Let me know down below! Every time I paint my nails, I always do something to mess it up. It doesn't matter how, but it always always ends up either with smudged nails, chipped polish, or both. Then, I look at how I can cover it up without having to re-do the entire polish. Who's with me on this? To fix the solution, my coworker introduced to me a cure - a remedy. I've had my doubts on this nail polish dryer, but not anymore. Right after you finish painting a hand, spray this on each nail, and it just hardens it up saving countless minutes of you having to patiently wait for it to dry, before you move on to your next task like writing my next post. My skin just likes to randomly break out sometimes, especially around that time of the month (ladies, you know what I'm talking about). Around that time, or whenever I feel one sneaking up through the cracks, there are a few things that I do to prevent it from happening. Get your pen and paper ready, for I'm about to reveal some award-winning secrets of mine that will change your skincare routine around. After I thoroughly cleanse my face, I use the Clarins Toning Lotion to rid my face from any excess makeup that might still be there. You never know, half the time I think I got everything off, but it shocks me every time after I look at the cotton pad. I decided to try this toner awhile back on a whim, but I ended up loving and re-purchasing. I like the subtle fragrance it has, as it leaves my face feeling freshly clean and hydrated. 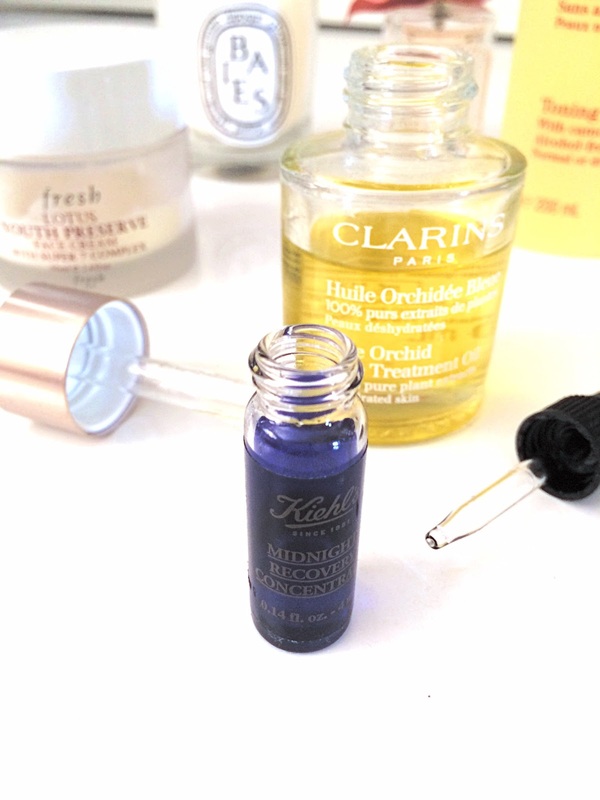 Next, I use the Kiehl's Midnight Recovery Concentrate to prep my face for the night. Honestly, I cannot praise this serum enough. When I ran out of this oil for a week, my face just felt different - a bad different. It just wasn't the same. This serum is amazing though, it's super hydrated and stays hydrated all the way through the night. Don't take my word for it, go out to your nearest boutique and grab a sample for the night. The next step is the game-changer. Typically, on a daily basis, I would just apply face cream and call it a night. However, when I feel a little something something surfacing, I combine the cream with the Clarins Blue Orchid face treatment oil. Apply this oil when you first suspect the incident, not after it occurs. It helps keep my face moisturized, and 70% of the time keeps the pesky pimple away. Of the 30% chance that it doesn't work, I give it an extra tender loving care and apply the Clean & Clear Acne Spot Treatment. I've been using this treatment since middle school, and it's been working for me every single time. Within a week, say goodbye to mister pimple. Sidenote: this works the best when you apply a thin layer on the pimple after you pop it. Of course, if it can't be popped right away, don't do it. I rather live with the pimple for a few more days, than to live with the scar for months. This is my nighttime acne-prone skincare routine. Everyone gets pimples, even the most "perfect" person will get something they get insecure about. It's how you react to it that makes all the difference. Yes, it's important to take care of your skin. However, don't center your life on that one pesky problem. Work around it. We can't let that pimple control our lives! Just smile through it, and no one will even care. What are some of your must-have skincare products that get you through this "difficult" time?